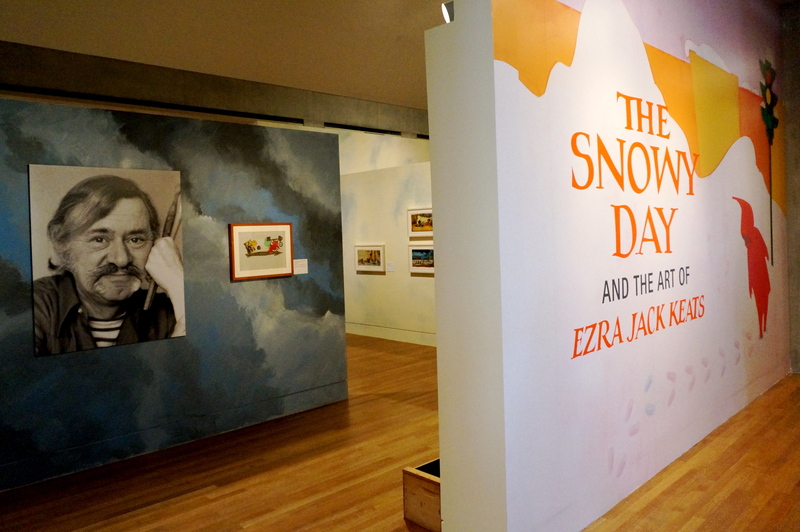 About the Exhibition: Enter the world of children’s author and illustrator Ezra Jack Keats in the Skirball’s The Snowy Day and the Art of Ezra Jack Keats (on view through September 7). The exhibition explores Keats’ life and career in one of the most delightfully designed, kid-friendly, art exhibitions to hit the L.A. museum scene. 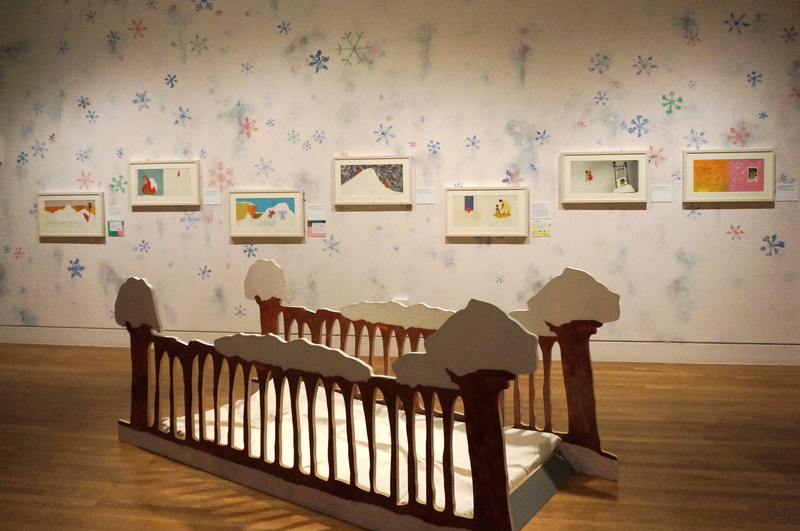 The Snowy Day is a must-see for families and anyone who loves children’s literature and the art of illustration and collage. The Snowy Day exhibition entrance, Skirball L.A. The exhibition includes over eighty original works; ranging from Keats’ preliminary sketches to his final, beautifully rendered, full-page book illustrations. 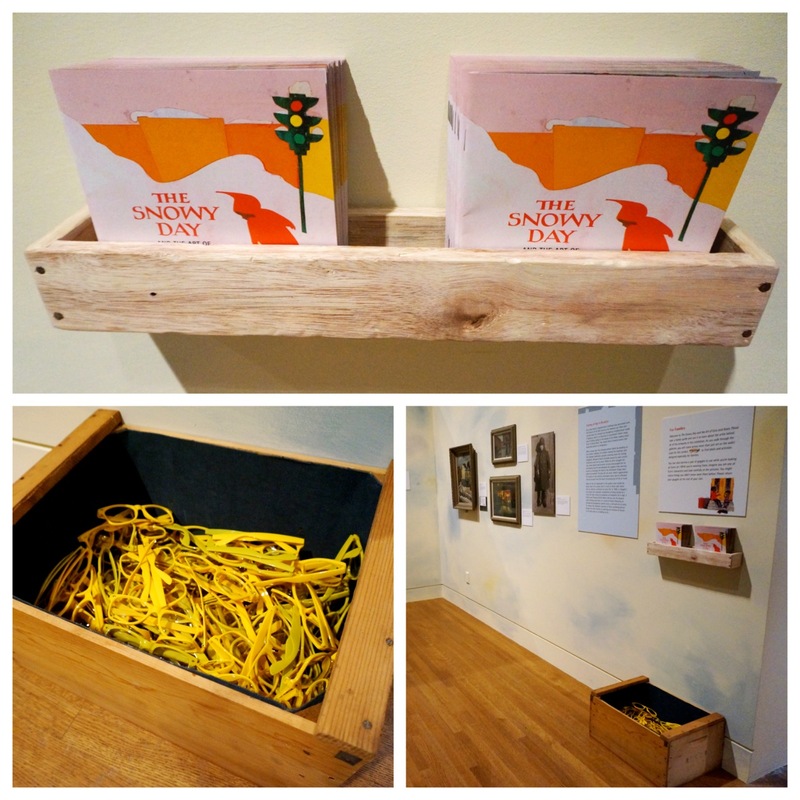 The Snowy Day is a traveling exhibition organized by The Jewish Museum, New York. The Skirball marks the exhibition’s last stop. The award-winning book The Snowy Day is about a boy named Peter who explores the wonders of a snowy day in his New York neighborhood. Peter slides down hills, makes snow angels, and footprints in the freshly fallen snow. But Snowy Day is about much more than child’s play. Published in 1962 during the civil rights movement, Snowy Day literally changed the face of children’s literature. 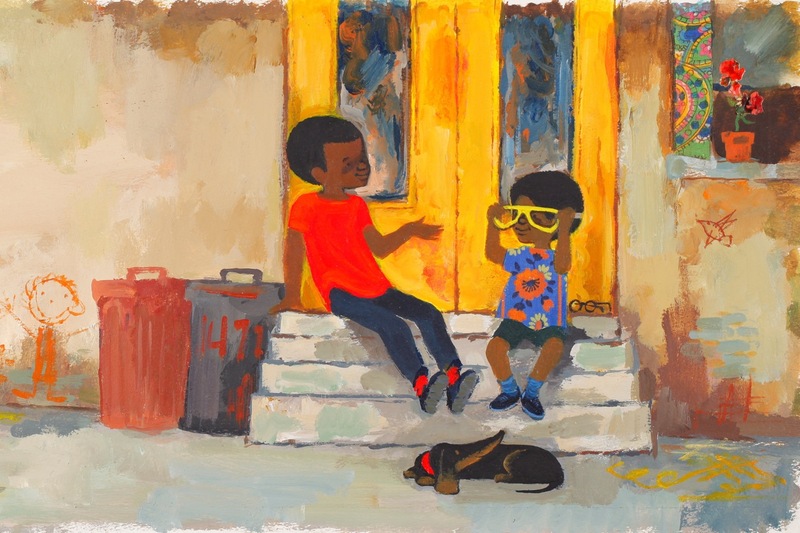 It was the first full-color picture book to feature an African-American main character. 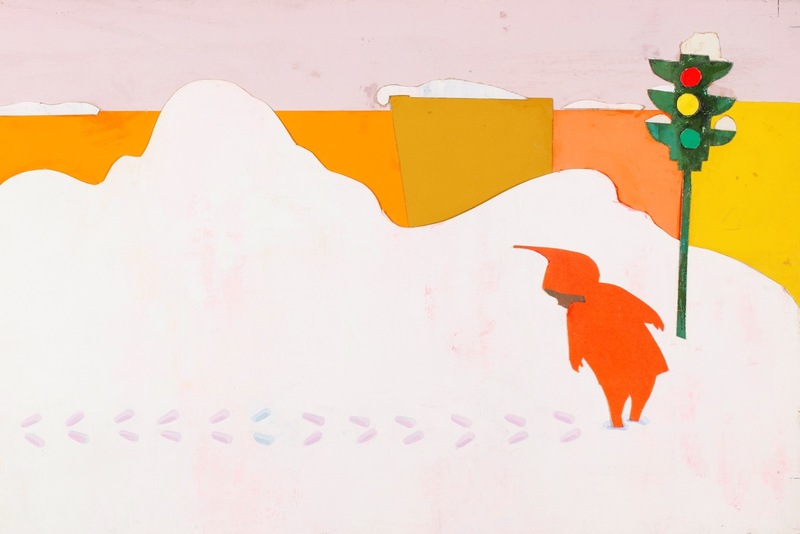 Ezra Jack Keats final Illustration for The Snowy Day (cropped), 1962. Courtesy of the Skirball Cultural Center. 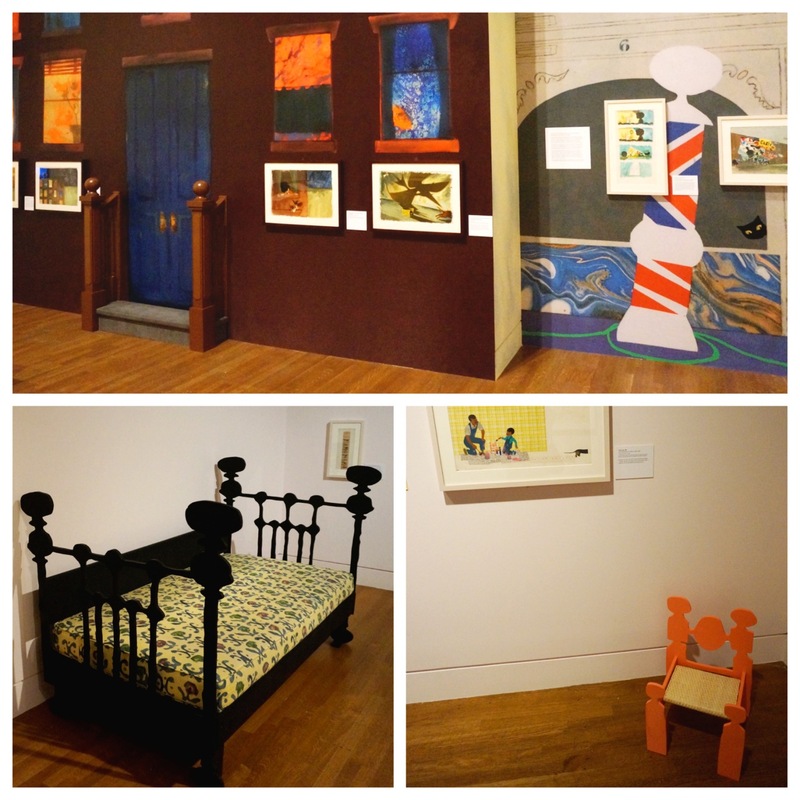 A 3-D Experience: From the moment you set foot in the galleries, you’ll see that this is not your average exhibition. The exhibition’s immersive design beckons visitors, young and old, to step inside the colorful pages of Keats’ books. Snowy Day 3-D exhibition features, Skirball, L.A.
Furniture, wallpaper, and even a Brooklyn stoop – fashioned after Keats’ illustrations – set the stage for a unique 3-D experience. Snowy Day family guide and goggles display. First stop, grab the exhibition’s family guide and activity booklet. Then put on a pair of yellow goggles in the basket below. They’re just like the ones in Keats’ book Goggles! (1969), an inspirational story about how Peter (the character from The Snowy Day) uses his brains, rather than his brawn, to outsmart neighborhood bullies. Ezra Jack Keats final illustration for the book Goggles! (cropped), 1969. Courtesy of the Skirball Cultural Center. Next, you’ll notice that many artworks are hung lower than usual on the gallery walls. 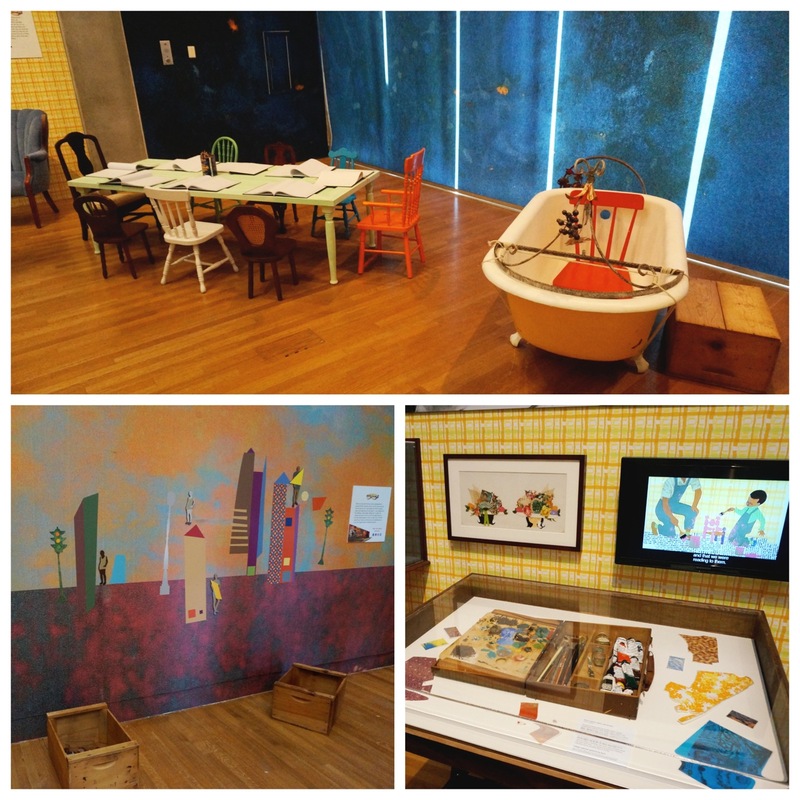 The Skirball did this intentionally so kids can easily view the art and see the gorgeous details of Keats’ collage work. This is a key element for inspiring young visitors, and I hope more museums will consider doing the same for at least a few pieces in their collections. 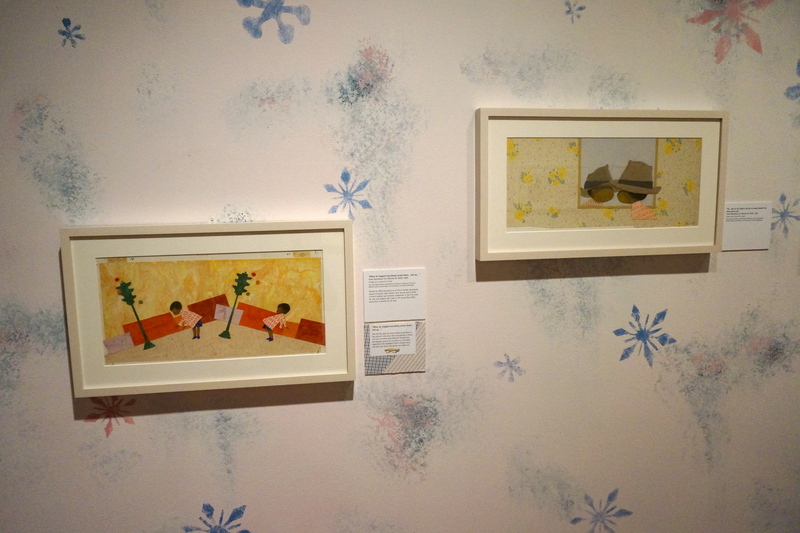 You’ll also find special wall labels written just for kids throughout the exhibition. Curator Erin Clancy discusses Keats’ illustrations for the book Goggles! at the The Snowy Day preview. 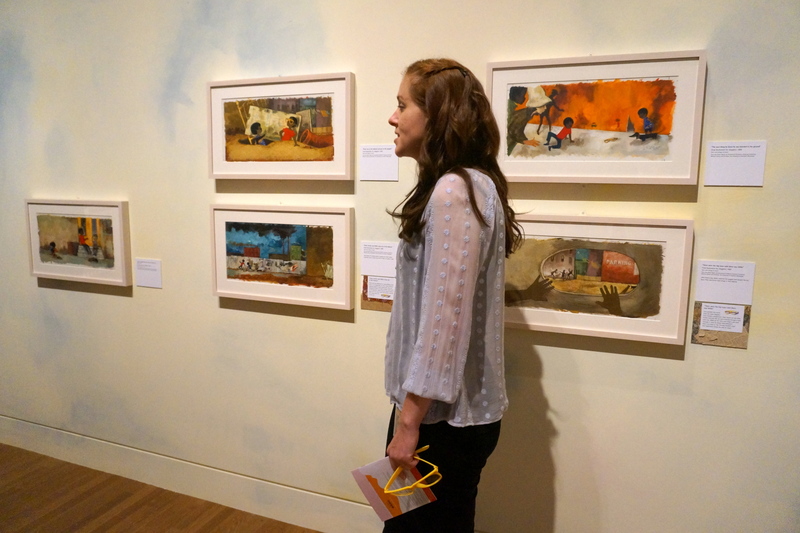 The exhibition’s curator, Erin Clancy, is an expert in children’s literature and the busy mother of a 3 year-old. At the preview, Clancy told me how her role as a mother influenced her work on The Snowy Day installation for the Skirball. Clancy takes her son to museums often so she knows firsthand what it takes to engage children in museums. That’s why Clancy, and her Skirball colleagues, made sure there are things for kids to not only see, but do. The exhibition includes several great interactive features. Simulated snow walk feature in the exhibition. Kids will love interactive features like the simulated snow walk, inspired by one of Keats’ Snowy Day illustrations. They can recreate Peter’s snowy adventure by sinking their feet into the exhibition’s snow and creating footprints across a bridge like the one in the book. 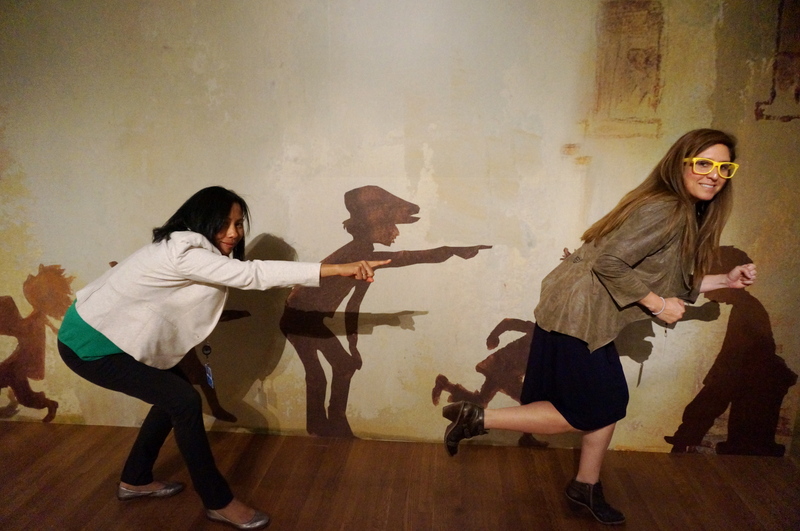 Skirball staff get into Keats’ characters at the exhibition’s Shadow Wall. At the Shadow Wall, visitors can get into Keats’ characters by striking a pose and casting a shadow of their own. Keats’ used shadows in his illustrations to communicate different emotions and moods. Use the hashtag #snowyday to share your Shadow Wall selfies during your visit. Walk in Someone Else’s Shoes: Inspired by his childhood memories, Keats’ stories focus on the small “in the moment” experiences of childhood rather than large complicated plots. In these small moments, Keats illustrates the shared humanity of childhood regardless of one’s race and gender. In The Snowy Day, Keats’ said he wanted to convey, “the joy of being a little boy alive on a certain kind of day, of being for that moment. And that’s exactly one of the things that struck me most about the Snowy Day exhibition — Keats’ unique ability to vividly capture the real-life wonders of a child’s world. Ezra Jack Keats final illustration of Peter trying on his father’s hat for Whistle for Willie (right). I was so moved by the illustration of Peter trying on his father’s hat (above) from the book Whistle for Willie because it reminded me of when I was a child. It conjured up fond memories of stepping into my father’s shoes and the klip-klop sound of my footsteps as I tried to walk in them. Something I hadn’t thought about in years. Putting yourself in someone else’s shoes is a central theme in Keats’ work. Keats said, “If we could all really see (‘see’ as in perceive, understand, discover) each other as exactly as the other is, this would be a different world.” A notion that aptly highlights the Skirball’s mission of promoting cross-cultural understanding. Snowy Day hands-on studio gallery. Studio Gallery: In a separate gallery, you can learn about Keats’ artistic process in a display filled with his collage tools and materials including samples of his handmade marble paper, which he used in many of his illustrations. Then try your hand at writing a story and making art on the studio’s Collage Wall. Or just relax in the room’s comfy furniture and read Keats’ books and other children’s literature inspired by Keats’ work. I can’t wait to take my children to see this wonderful exhibition that celebrates the joys of childhood, reading, and the power of art to transform our world for the better. See you in the galleries! Spend the night in Noah’s Ark at the Snowy Day Family Sleepover, June 7-8 (see below). Photo by Bebe Jacobs. Snowy Dreams Family Sleepover, Saturday, June 7, 6:00 p.m.- Sunday, June 8, 9:00 a.m.
Skirball sleepovers are so much fun and tickets sell-out fast. So get your tickets now. Ages 6+.